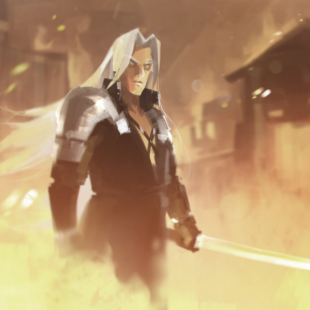 Concept artist Lap Pun Cheung spent six months speed painting an enormous collection of Final Fantasy VII art. When it comes to Final Fantasy there's arguably no entry more important and influential than Final Fantasy VII. Turning the franchise into a household name, it almost single-handedly introduced a generation of console gamers to RPGs. In the process, it earned itself a legion of fans who, to this day, hold it near and dear to their gaming hearts. Take concept artist Lap Pun Cheung, for instance. In an effort to pay tribute to the game, he undertook a six month speed painting challenge aimed at creating a massive collection of art pieces recreating key moments from the game. His efforts recently came to a close, yielding a whopping 130 unique illustrations. Included among them are illustrations of the game's opening bombing mission, Aerith and Cloud's meeting in the church, Sephiroth's destruction of Nibelheim and many, many more. Setting aside how impressive it is that Cheung was able to produce this much art in such a short period of time, you really do have to marvel at just how genuinely good his Final Fantasy VII pieces are. I'm not even that big of a VII fan and I found a whole bunch of pictures that I would love to have hanging off of my office wall. Take a look at Cheung's collection and let us know what you think. Which are your favorites and what other games would like to see given a similar treatment (cough Final Fantasy VI cough)?